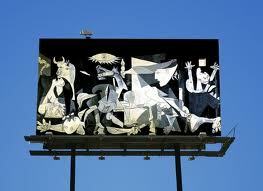 Billboard Art which is a Outdoor advertising is one of the oldest and purest forms of communication. From the earliest painted Roman walls to the latest video walls and laser projections in Times Square and Piccadilly Circus, commercial signs have always been ubiquitous. "Advertising Outdoors" analyzes this dynamic, exciting exterior medium that has until now remained largely undocumented. Early in the 20th century, American manufacturers and retailers discovered miles and miles of new advertising space, and the audaciously oversized billboard was born. It looks at the art and ingenuity of art directors and copywriters who devise the artwork and ideas, and explores how their creative input drives an industry that supplies large-scale frames: billboards, transit shelters, bus sides, train cards, phone boxes, taxis, airships and many other location opportunities. An essential book for designers and advertising professionals alike, "Advertising Outdoors" looks at the rise of 'commercial art, ' the development of advertising as a discipline and an industry, and the role that advertising plays in modern life, making direct reference to examples of successful advertising campaigns. Specific chapters feature such diverse subjects as the 'rules' of the poster and the demands of outdoors; the development of a brand identity; the relationship of textand image; the case for wit and humor; and the future of the poster in multi-media campaigns. For a century, billboards have recruited, congratulated, teased, sold, and seduced us, promoting everything under the sun, from hosiery to war bonds, presidential candidates to rock shows. GREAT AMERICAN BILLBOARDS not only offers a lively look back at changing styles, products, and tastes, but is also an important visual record of this largely unheralded yet ubiquitous American art form.Reviews"This slice-of-life compendium entertains and educates. "-US Airways Magazine"Although the pictures are fascinating, Basten'¬?s text is quite a bonus. "-Oklahoman"An illuminating guide to a country, its culture, and its people. "-American Way"Beyond the irresistible nostalgia is a fascinating glimpse of the evolution of our consumer nation. "-Dallas Morning NewsFeatured on Entertainment Weekly'¬?s "Must List"